Perm State Medical University was established in October 14, 1916 in the city called Perm in Russia. The University is one of oldest and top universities to study MBBS in Russia. The university was started as a medical faculty in the year 1916. During the initial years after establishment, this faculty was a part of physics and mathematics faculty. Later, in 1917, PSMU became an independent department of the medical faculty. Perm State Medical University organized MCI Coaching in the University with the joint efforts of Rus Education. 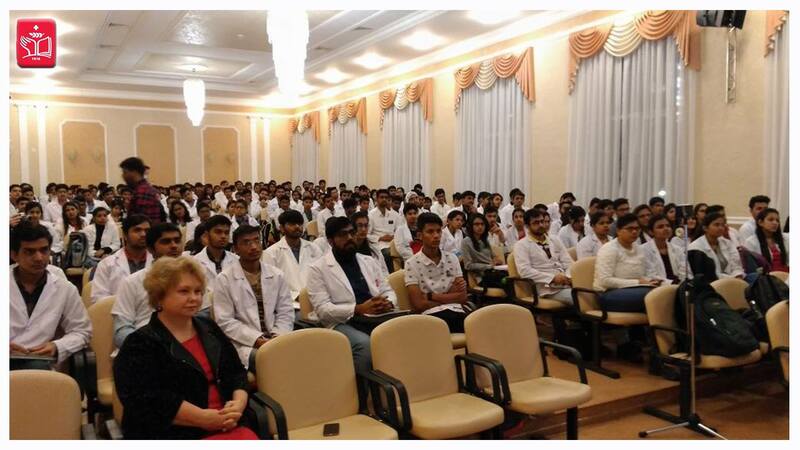 They arranged special visit of an Indian Professor working in AIIMS, New Delhi, India to deliver a lecture on the subject of Human Anatomy to Indian Students studying MBBS in Perm State Medical University, Russia. The speaker enlightened about the additional clinical procedures which are practiced in India. He also talked about Gross Anatomy and Microscopic Anatomy, the differentiation of three germ layers from a single celled zygote. After a quick revision of events that occur during the first three weeks of human development, development of pharyngeal arches was discussed. This MCI Coaching was attended by the Medical students of Perm State Medical University, and the teaching faculty. The speaker also emphasized the importance of application of the knowledge of pharyngeal arches in clinical practice.